Our inventory of unicorn supplies and favors is second to none! From fun toys and games to decorations and accessories, we have everything you�ll need to make this the perfect theme at your upcoming party. Look through all of our exciting unicorn party supplies today and there is no doubt that you�ll be ready to host a sparking fun gathering in no time! Young girls love nothing better than the allure of living in a fantasy world, and there are so many different ways that you can help make that dream a reality. Decorate the main room for a birthday party or just deck out their everyday play space and you can completely transform their world and bring them to that happy place. One of the most popular fantasy features these days are unicorns, and we have all of the party supplies you could possibly need to bring this idea to life! Our products run the gamut from fun things to wear to exciting things to put up on the walls. Help your daughter and all of her friends dress the part with different wearable items like headbands and wands. Hang decorations like whirls and banners up on the ceiling and walls to create the perfect atmosphere. Add even more fun with exciting toys and games that will help keep them occupied for hours like unicorn poop and bean bag toss. No matter where your imagination goes, we definitely have everything that you�ll need to make it the perfect party. 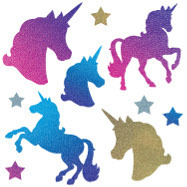 Browse all of our cheap unicorn party supplies and feel free to give us a call if you have any questions about any of the products or when you should expect for them to be delivered. We are looking forward to helping your make your party the absolute perfect celebration you could possibly hope for!